Well, here we are near the end of June, and what a busy month it has been for Big D Country. We are beginning our move to the studio trailer and out of the house, much to my wife's delight. She is hoping for some crafting and sewing space. I guess that will be her girl=cave and the radio offices will be the man-cave, or as close as it's going to get for a while. If you'd like to follow local news, community announcements, and such, follow us on Facebook at http://www.facebook.com/bigdcountry. We'd love for you to "like" us and share the station with your friends. I'm taking a brief hiatus from the daily broadcast due to the move. The studios are still in the house but the music library is in the process of being moved first. I assure you, this is temporary and I'm looking forward to returning to the air, probably in early August. Someone asked how many songs we have, and I honestly have to say, "More than I thought." 10,000 would be a reasonable estimate - and that's the records. It's hard to say. I have a loaner USB turntable and have been working to convert more of the vinyl to mp3. Space will be at a premium in the office trailer (it is 8 x 26) and I am trying to fit what is now two rooms of radio operations into that space! So far, so good, but it will be a tight fit. 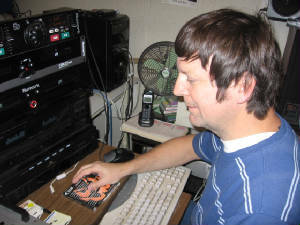 I know I need to be updating the blog more often but I'm putting in long days, and as most folks know, there is little to no pay in Internet radio. We about break even so I have never taken a single paycheck from the station. I have recently begun to resume some of my marketing ventures on the side. My wife and I are using the Dave Ramsey methid of hetting out of debt and are making a little prohress, but we are stuck at "get your income up." We're [utting in a lot of hours. One thing I hope to do along with the move is to locally get my Part 15 AM station reyurned to the air. This will cost about $600, so if you are able, please consider making a donation to us. Our address is listed at the bottom of the website and I also have a PayPal account exclusively for the station. We've been running some ads to try to offset some of the cost, but if we could get listener contributions up I would like to cut back on having the number of breaks we are carrying now and reduce it down to two per hour.